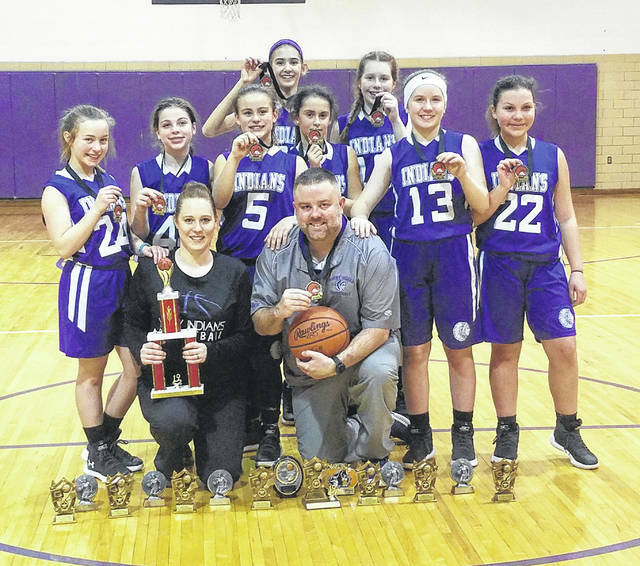 Mount Gilead’s youth girls’ basketball program has been strong in recent years, compiling a 45-5 record over their last three seasons. Over the past couple years, the Mount Gilead youth girls’ basketball program has been making strides. Coached by Kyle McKenzie, the team of sixth grade girls has been 45-5 over the past three years. This year, they won the Mid Ohio Basketball Association and have placed second in a tournament hosted by Cardington. “Most of these girls have been together since fourth grade,” said McKenzie, who coaches the team along with Chelsey White. The team’s season runs from November through March and consisted of 15 regular season game, as well as a few tournaments. White noted that a big part of the team’s coaching revolves around teaching the girls to play an aggressive, fast-paced style. Members of the team have enjoyed their time with it. Several of them, including Kaydence McKenzie, Ava Baker, Megan Beck, Sofia Schroeter and Kimberly Staley specifically said they enjoy how all the players work as a team and support each other, while Baker and Faith White commented on enjoying the fast-paced, aggressive style of play. Trinity Schrote is in her first year with the program after previously playing in the River Valley youth programs, while Genna Smith joined the team this year in order to try a new sport. Also on the team are Olivia Long and Brooklynn Dower. Kyle McKenzie, who has been involved with Mount Gilead youth sports for a few years, said that he is looking for both more children, both boys and girls, to participate on those youth teams, as well as more parental support for the programs.